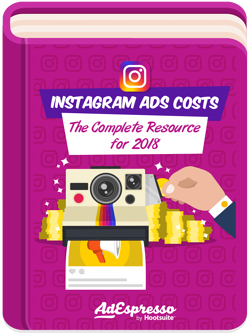 Instagram Ad Costs: The Complete Updated Resource for 2018! Instagram was born in October 2010, exclusively as an iOS app. In 2017 the photo-sharing/social networking platform boasted over 800 million monthly active users, and 80% of them follow 1 or more brands. Over 15million business are registered on Instagram, 2M advertisers are active monthly, and Instagram ad revenue forecast for 2018 is $6.84 billion. There's lots of data on Instagram online, but no answers to the Big question: how much do Instagram ads cost? We analyzed almost $300 million of ad spend data in 2017, which will give you an excellent reference point to estimate the costs of advertising on Instagram in 2018! Our unique data will, undoubtedly, give you an idea of the costs to expect when launching your next Instagram ad campaign. Instagram Ads Cost 2017 Benchmarks is an incredible resource for when you're placing bids, setting your Instagram ad budget, and whittling down your target audience. Use This Data to Set Your Own Parameters, but remember that every ad campaign will be unique, since every business is unique, like you.